With St. Patrick’s day around the corner we all become a little bit Irish and if you become a bit more like a leprechaun then this would be the perfect t-shirt for you. 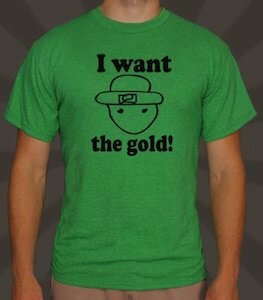 This t-shirt shows the face of a leprechaun and the text “I want the gold”. And of course this St. Patrick’s day t-shirt comes in green but there is more then one green to choose from. It also comes in a men’s and a girly version and both come in a wide selection of sizes. And a nice t-shirt that is all about the gold of course is printed in a quality screen print way on a 100% cotton t-shirt. So start planning for St. Patrick’s day and start by ordering your Leprechaun I Want The Gold T-Shirt.